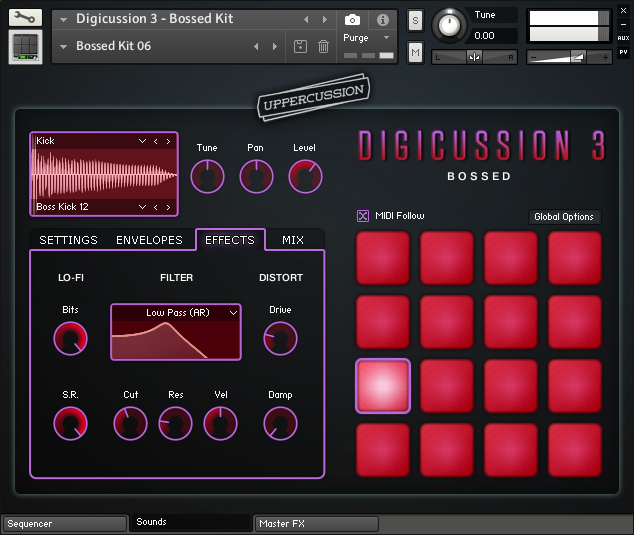 The Kontakt Instrument version of Digicussion 3 is an advanced drum machine to customize the sounds and kits in a multifunction interface which includes all kinds of sonic controls, professional mastering effects, a built-in sequencer, preset kits saved as Kontakt snapshots and drum patterns for every kit. 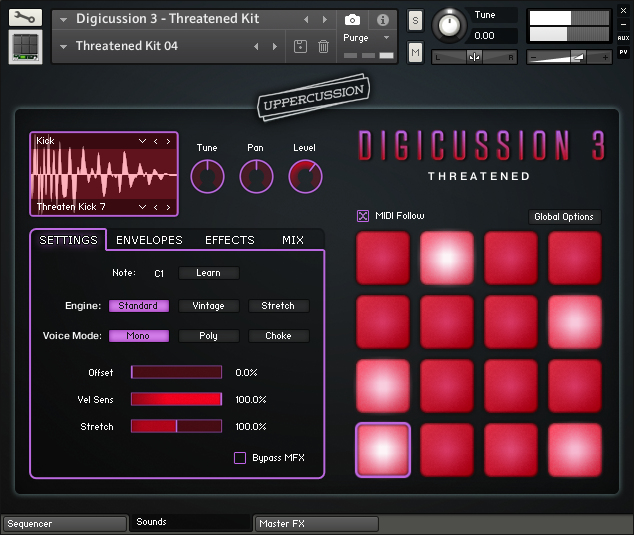 The Digicussion 3 Kontakt Instrument was created in collaboration with Icebreaker Audio. 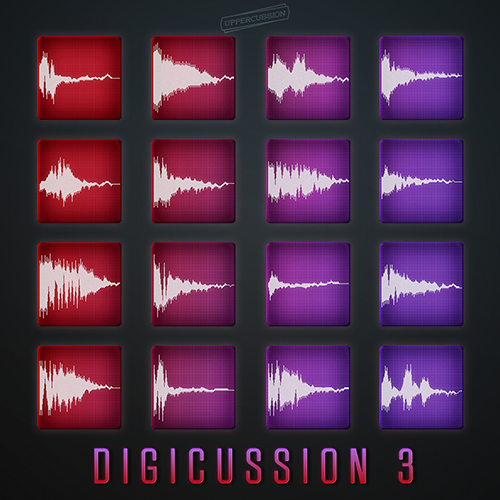 Digicussion 3 is a collection of 50 drum kits that take the Digicussion series to the next level with 50 kits of confident kicks, boastful snares, smug hihats, crass claps, humble percussion, jaded cymbals and an assortment of emotional one shots. Each drum kit has its own character and the samples within the kits are perfectly in tune with one another, providing a unique aural experience with each one. 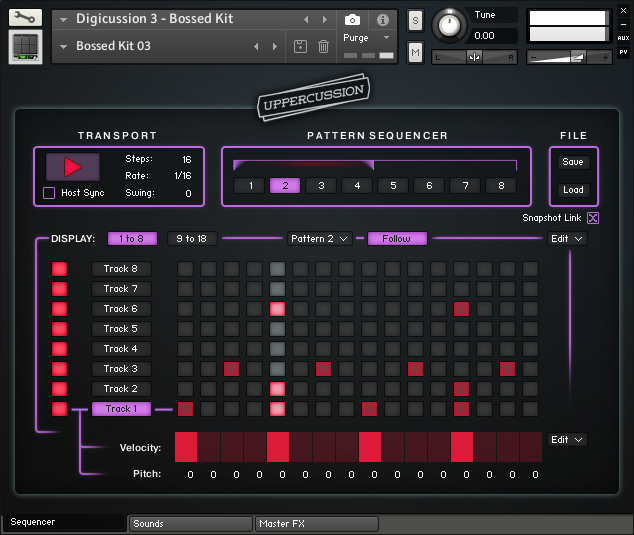 Bossed Kits - analog, analog-layered, synthesized sound kits. Disturbed Kits - unique, weird, quirky, one-of-a-kind kits. Primed Kits - processed acoustic and recording session kits. Spaced Kits - large room, ambient, echoing, spacious kits. Threatened Kits - aggressive, highly processed, angry kits. Volume, Pitch and Filter envelopes per sound. Filter, EQ, Distortion, Lo-Fi and Dynamic effects per sound. Master FX including analogue modelled EQ, Compressor and Tape Saturation. 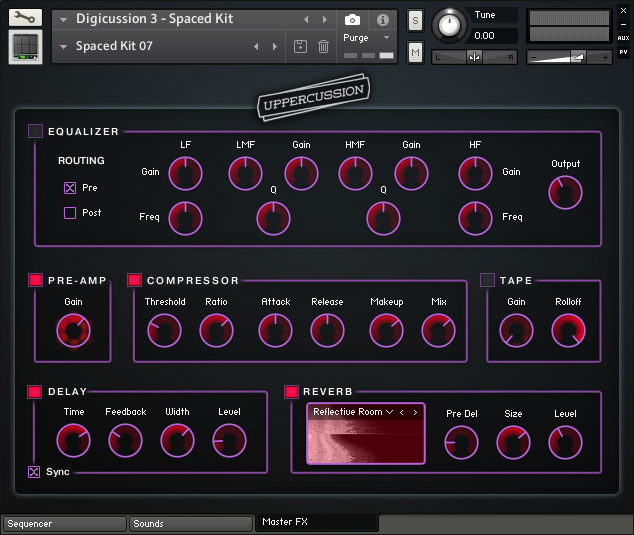 Convolution Reverb with 20 custom impulse responses. Three engine modes, including a vintage SP1200 emulation. Preset kits saved as Kontakt snapshots. Preset MIDI maps and the ability to customize the mapping. Compatible with Komplete Kontrol Native Map and Light Guide. *The Kontakt Instrument library is for use with the full version of Kontakt 5.4.1 or later and is not compatible with the free Kontakt player. Five kit categories: Bossed, Disturbed, Primed, Spaced and Threatened. Total size is 180 MB.